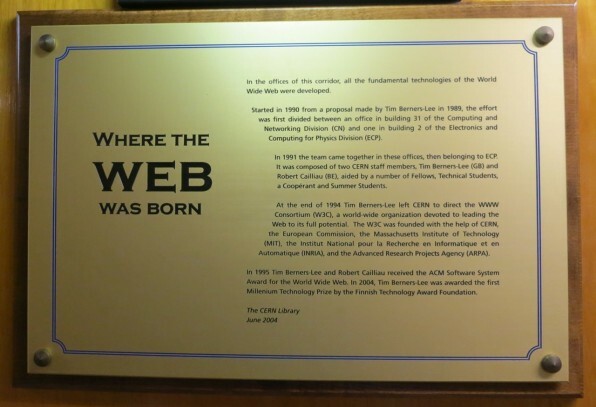 "A brass plaque commemorates the offices and hallway where the World Wide Web was invented at CERN (European Center for Nuclear Research) in Switzerland." More people probably know who invented the printing press than who invented the World Wide Web. And yet the Web has reshaped our world as much as movable type did in its time. This must be a failure of today's attitudes: in another era, every adult and school child would automatically know the name of Sir Timothy Berners-Lee as well as they know the name of Johannes Gutenberg or of Alexander Graham Bell. It is ironic that the origins of the Information Age are not popularly discussed outside IT circles. Considering the incredible impact the Internet and Web have had on global society - over 2 billion people, one third of the world's population use them every day - the names of their inventors are not celebrated. They are not household words. Why aren't they household words? This is a disturbing aspect of the daily data flood. We don't pay enough attention to the data that matter. We give too much credit to random information that floats by without double-checking it. Heard a conspiracy theory? Or an urban myth? Is everyone suddenly using a new word? Confronted with a new Internet meme? Don't know what a meme is? Or who invented it - or how the term was applied to Internet culture? Don't know that a Web designer who transformed the way Internet memes are communicated just died? This designer helped shift the Web from text-based to visual- and video-based transmissions; he helped establish the Web's interactive and multimedia resources. The more we know, the more we need to know how, why, where and who. Instead of skimming the surface, we need to get to the bottom of the things we take for granted, or accept at face value. The invention of the Internet (a global system of interconnected computer networks) predates the World Wide Web (an Internet-based resource and service). The Internet had roots in the 1950s, and breakthroughs in the early-to-mid 1970s, mainly in the United States. Two members of the Silent Generation, Vint Cerf and Bob Kahn, are credited with being the fathers of the Internet in 1973, although several other people worked in this period on related breakthroughs; they are known as Internet pioneers. See my post on the larger historical context of the invention of the Internet, here. Few people are aware that the World Wide Web was invented at CERN, home of the Large Hadron Collider, the Mecca of particle physics. This occurred largely because of the demands of that field: there was a need to have physicists globally connected to one another, so that they could share data quickly when they were divided by distance or did not have common computers. Tim Berners-Lee, an English computer scientist and Baby Boomer, had already devised the concept of hypertext at CERN in 1980. Then in March 1989, also at CERN, he established the concept of the Web and made it work, by marrying hypertext to the Internet. His boss at CERN called the Information Management proposal, "vague but exciting." 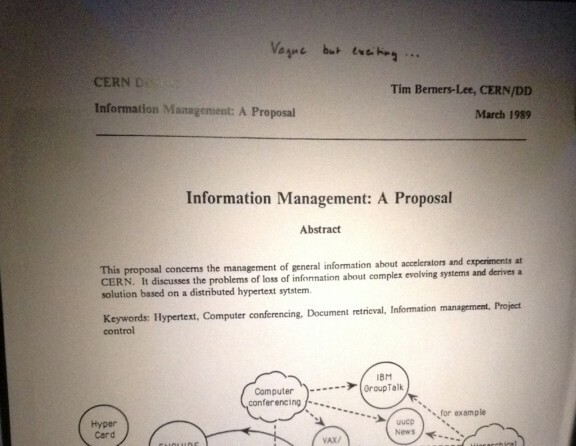 Berners-Lee's distributed hypertext system (March 1989); his boss's note: "Vague but exciting." One of National Geographic's writers, Andrew Evans, has a talent for tracking down the nitty gritty details beneath the information we take for granted. Everyone knows about the Mayan 2012 prediction, but earlier this year, Evans traveled to Mexico to take us right to the actual stone tablet with the famous end-of-the-world prediction on it (see my posts on his Mayan 2012 trip, with links back to his original articles, here, here and here). Now Evans is traveling through Switzerland, and has gotten to the heart of the Web's history. He just visited CERN, but the Large Hadron Collider was not his main focus. He wanted to find the origin of the great invention that was the casual by-product of quantum physics research: the Web. Hotel (2010). 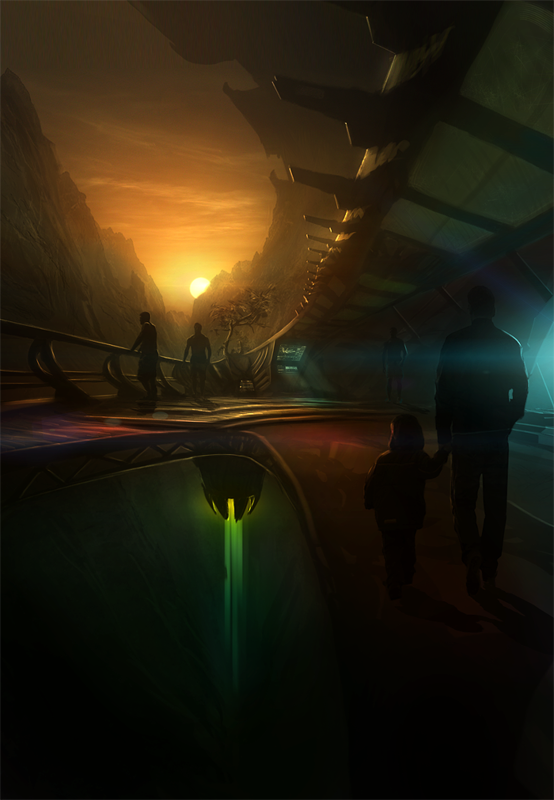 © By Majora28 (homepage here). Reproduced with kind permission. Occasionally, the MSM sites put out funny little reports that some bizarre new word has made it into the dictionary as part of their offbeat commentaries on how the impact of the Tech Revolution is changing our language and thus, affecting the way we communicate organically as well as mechanically. Usually these hot new words are cribbed from the user-generated Urban Dictionary or Netspeak. For example, Time recently reported here that 'Zombie Bank' and 'BFF' made it into the most recent edition of the New Oxford American Dictionary. Of course, the OED and its variants are renowned as much for their historical etymologies as they are for scooping up the latest words from the wash of pop culture that not everyone even considers words yet. One portmanteau that I am starting to see, and wishing I wasn't, is 'underdig,' a dismal combination of 'to dig something' in a 60s' sense (as in, to 'really understand something') and 'to understand.' Aside from these newcomers, what I've found equally interesting is the resurgence of certain standard words which suddenly, thanks to technology, I hear everyone saying. I'd say this dynamic of particular words becoming popular is a sign of how the collective unconscious works.